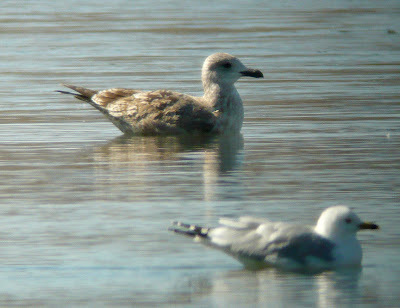 Here's an interesting gull that I found today with my dad Jim & Mike Freiberg at Cherry Creek Reservoir in the SE Denver Metro Area. 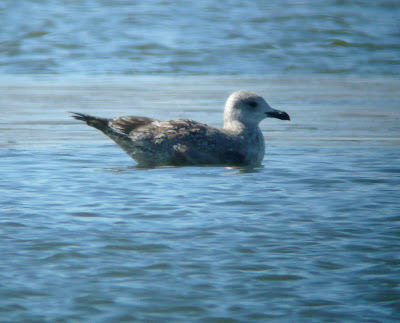 Much about it reminds me of a potential 1st-cycle Slaty-backed Gull that Christian Nunes found in Boulder last November. 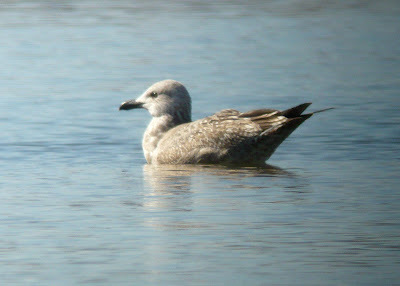 Size was quite similar to a nearby adult Herring Gull. Getting a little zonked for much analysis now (here's my post to Cobirds for a little more description), but check it out & let me know what you think. As always, click images to enlarge. 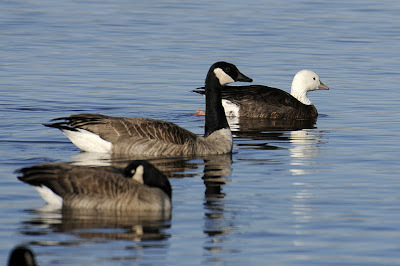 Yesterday, I found a cooperative Ross's Goose at Golden Ponds in Longmont, Colorado. A birding pal had told me about the bird a week earlier but I hadn't been able to find it then. Checking yesterday, I noticed a very small white bird in with large Canada Geese on a little residual ice shelf- cha-ching! This is about the only case where I like these big park geese- since they are so tame, they keep interesting birds like this Ross's Goose calm. They weren't even very nice to the Ross's- when it got too close to a massive Canada, the big goose would shoo it away, biting at its tail. 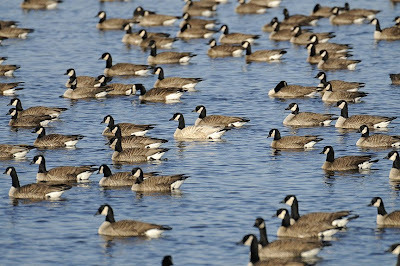 Whatever the case, I slowly worked down to get some shots from the bank, waiting for chances to tunnel through the big geese to get some shots of the Ross's by itself. After a while it retired to the water but stayed nearby, paddling along in the mini iceberg-laden water, accompanied by its reflection. 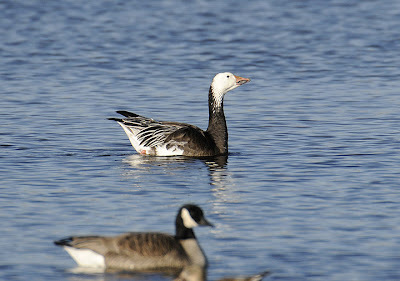 I think this bird makes a great comparison to the Snow Geese and odd Ross's Goose hybrids I recently posted- check them out if you haven't done so yet. Folks- I'm happy to announce that I'll be the keynote speaker at the 5th annual Ute Mountain-Mesa Verde Birding Festival based in Cortez, Colorado, 14-17 May 2009. Come on down to the fabulous Four Corners region to do some birding & take in the sights! If you've never been to Mesa Verde then that alone is worth the price of admission! And there's nothing like standing in 4 states at once. Hope to see some of you faithful readers there! 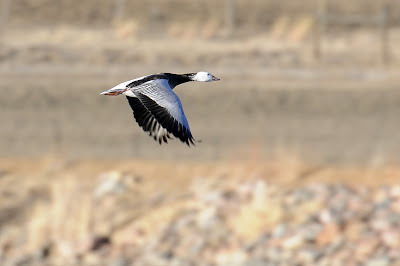 I headed over to a local birding hotspot in southern Boulder County, Colorado the other day to follow up on some reports of interesting geese. Pulling in to Stearns Lake with tasty late afternoon light, I immediately saw that I'd be able to burn lots of 1's and 0's on my memory cards. 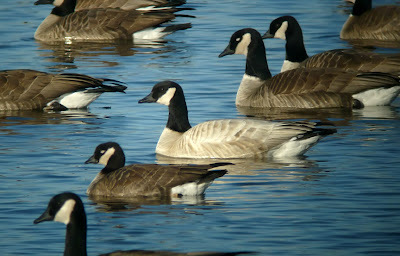 I toted my DSLR rig but also got set up to digiscope, as the geese out on the lake were mostly out of telephoto reach (at least for detailed photos.) 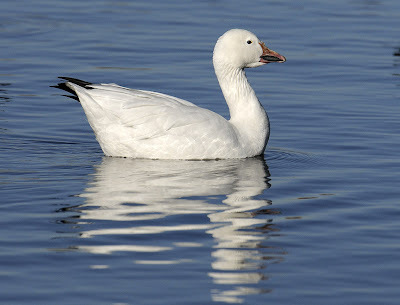 One notable exception, though, was this white-morph Snow Goose, which for a while was about the closest bird to shore. Gotta photograph something that bright! 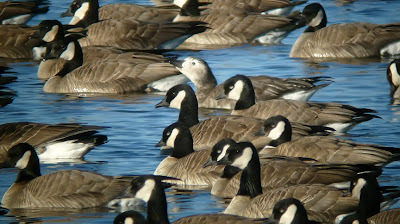 I then scanned a sleeping bunch of geese on some fairly close residual ice, finding two with white heads and dark bodies. 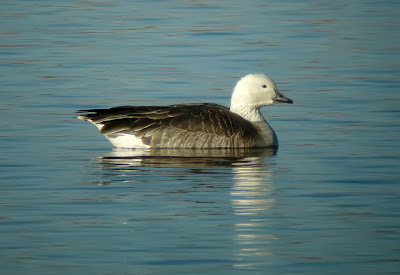 One obligingly woke up and looked around- a dark-morph Snow Goose (aka Blue Goose.) Sharp bird- after churning around for a while looking for accomplices it headed east, presumably to feed in nearby corn fields. 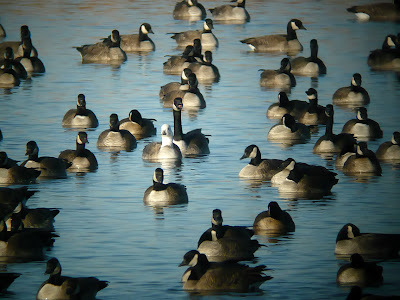 Interestingly, the two Snow Geese were about the biggest geese on the lake- almost all of the white-cheeked geese present (a few thousand) were lesser Canada Geese (parvipes subspecies) or Richardson's Cackling Geese (hutchinsii subspecies.) 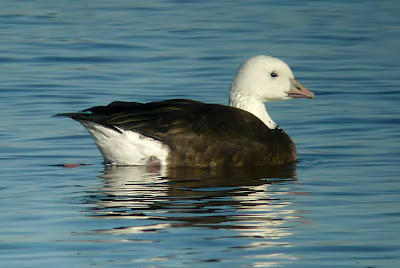 Mainly, though, I was interested in studying and photographing birds that had been reported as possible dark-morph Ross's Geese (a very rare form, one I've never seen.) 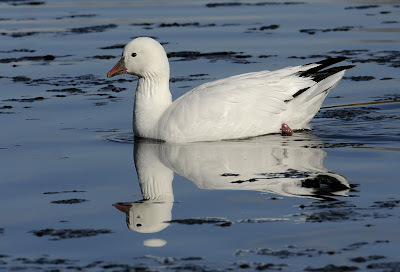 The other white-headed, dark bodied ice sleeper soon awoke and began swimming, clearly one of the birds of interest. I digiscoped a bunch of snaps and got a flight sequence on the ol' DSLR when it shuttled towards the main crowd of wee white-cheekers, where it soon immersed itself. I immediately saw why it was a noteworthy bird, but as others had noted, it didn't quite fit the (few) illustrations, photos, and descriptions available for a dark-morph Ross's Goose. Neat looking bird, but danged confusing. As if that wasn't enough, there was another similar bird on the lake, but with a gray bill instead of the pink (indicative of an immature bird.) The bill shape on this one was a bit more Snow Goose like, but the bird is tiny, the size of a Cackling Goose or perhaps even a bit smaller. 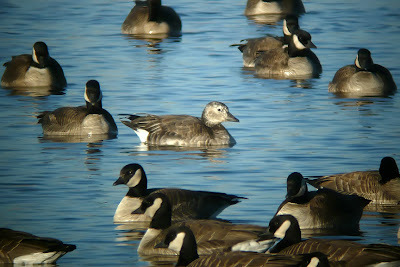 And there was one more immature bird present with a more gray face, looking a bit like a juvenile Blue Goose but again too small for even lesser Snow Goose. These birds remind me of a series of birds that appeared in se. WA (and one in sw. WA). 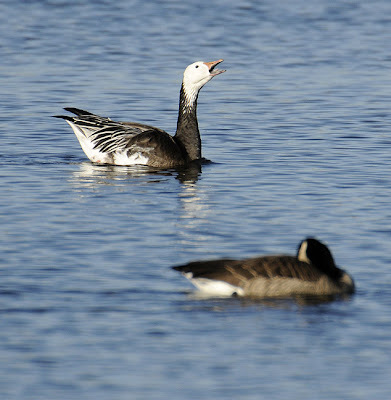 Ours were all adults, and all had this very dark body, darker than any white-cheeked goose, much like your adult. 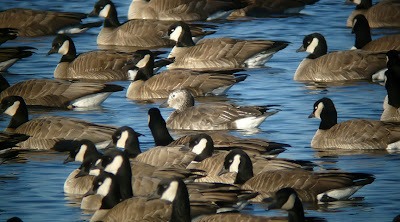 Head patterns varied, were all something between a Snow or Blue and a Canada. Size was similar to a parvipes. Bill kind of in-between Snow and Lesser Canada. In other words, they looked like your adult, but yours looks more like it has Ross's and Cackling as parents. 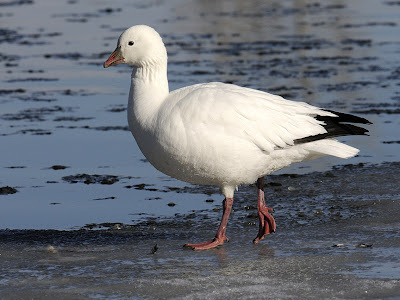 And the imms are even more confusing, because the bills seem to look like they have Snow Goose in 'em, not Ross's, but the birds seem too small to have Snow Goose as a parent. In any case, none of these are blue morph Ross's, nor are they some dwarf Lesser Snow. The head and bill would argue that they couldn't be an aberrantly plumaged Richardson's. At first blush, it seems almost inconceivable that the adult is not part Richy and part Ross's, but then how does one get the super dark body plumage. Then one would have to postulate a BLUE MORPH Ross's x Richardson's, which starts to seem increasingly improbable. But if it waa a blue morph Ross's x Richardsons, then how does the head and neck get to be so white. 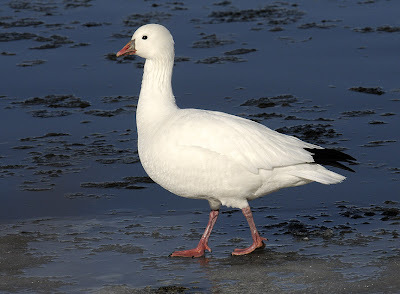 The answer, in the end, to this brand of oddity is likely to be had in an aviary... we need to find someone who has a blue morph Snow x white-cheeked Goose and see what they look like and the variation therein. Particularly a heterozygote Blue morph x white-cheeked might produce some of these odd features. In your case, it would likely have to be a heterozygote Ross's x white cheeked. Or then you wonder, could this be one of those odd birds with more than two species genes involved. It happens in captivity, but I don't know if it happens in the wild. I agree with Steve that none of these birds are blue ROGO. The last one certainly looks a lot like an imm SNGO, but smaller than CACG??? I think that most of us believe that F1 hybrids have to have some combination of parental traits and intermediate traits, but if one looks at dabbler hybrids, we can see that most F1 male hybrids have some patch of white/pale on the head that is not expressed in either parental species. Perhaps, hybrid geese do similar things. Of course, white head and neck could be a dominant gene expressed in such hybrids, too. 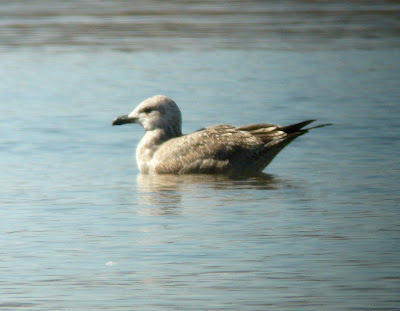 The adult is certainly somewhat ROGO-like, but, possibly, SNGO x CACG could account for its parentage. However, the bit of blue at the base of the bill (but not nearly as much as is typical of adult ROGO) does suggest ROGO genes (though I don't see much expression of the usual tubercles on the bill of that taxon). So what's going on here? 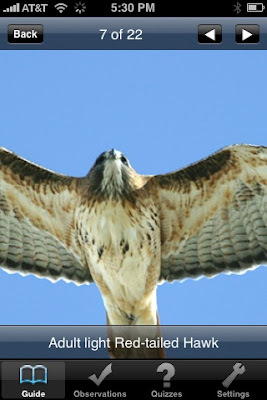 Any one of these would be a head-scratcher, but three such birds at the same spot? I guess the two juvs could be from the same clutch but what about the adult? And none of the three were associating with each other within the large flock- you'd think if they got there together they'd stick together. Anyone know a waterfowl breeder who may have combos that look like these? 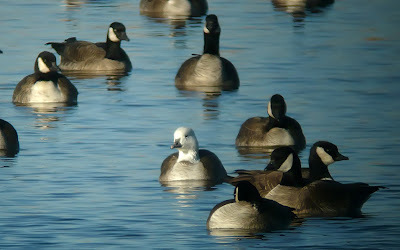 One more odd bird was at least a lot easier to explain- a leucistic Canada Goose. 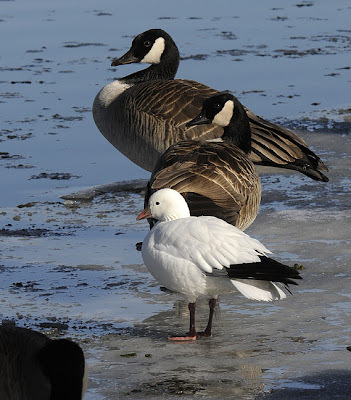 Interesting that the neck and head pigmentation is normal while the body is "dilute", although I've seen other similarly differentiated geese where the head was normal but body abnormal, or visa-versa. 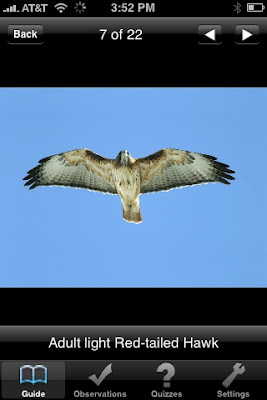 The 2009 crop of birding-related offerings for iPhone & iPod Touch is off to a very strong start with the release of Raptors by Natural Guides, LLC. Jerry Liguori, one of the top raptor authors and ID experts in the US, provided the knowledge and images that make this a fantastic portable reference for 19 of the most common raptors (and vultures) that occur in the US. After the gorgeous Golden Eagle closeup on the startup screen (at right), the app takes you to a listing of the featured species. Clicking on a species takes you to a page with text information about the bird (overview, plumage, size, call description, habitat, prey, nesting information, and trivia.) There are links to images (the program features over 200 photos), sound samples, and range maps for each species. The images are zoomable, but not rotatable to landscape format (an enhancement that would be nice.) There are a couple other features beyond the guide functions to mention, too. First, there is a quiz generator with images, sounds, or trivia questions. 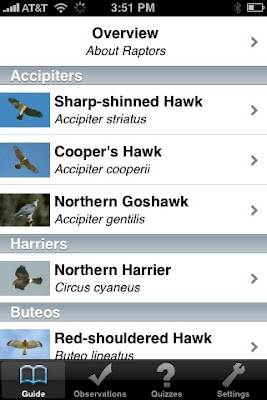 There's also a checklisting function to record your raptor sightings. The current iteration of the app has a few little bugs- sometimes it quits without apparent reason and there are a few little typos that I've found, but I anticipate these will be addressed in future updates. 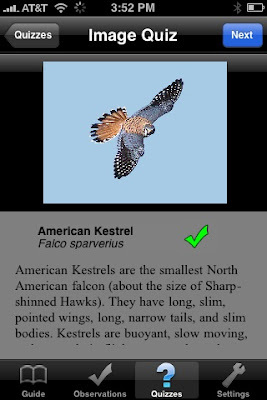 Perhaps they'll round out the list with the rest of the regularly occurring North American raptors, too. 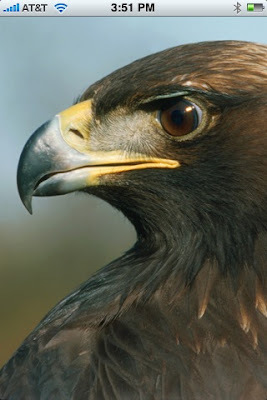 Especially across the southern part of the country, many interesting & sometimes fairly common species (like Harris's Hawk and Crested Caracara to name a couple) should really be included to make this a comprehensive guide. 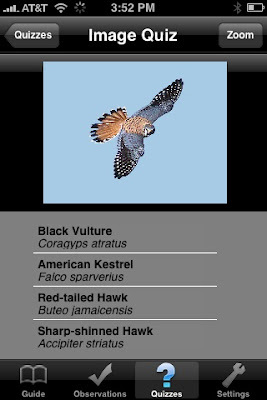 I'd hate to think that someone new to observing raptors would get stymied by something fairly common in many areas like Mississippi Kite just because it wasn't listed in this app. Still, I think this is a harbinger of more to come for iPhones and other smart phones and mobile computing devices, and I anxiously await the next "guidebook 2.0" to drop.